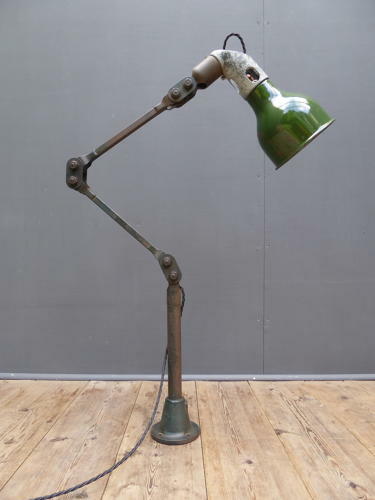 A fantastic example of an original vintage industrial Mek Elek machinist wall lamp. A beautiful three arm Mek Elek lampin original paintwork with a fantastic patina, boasting the usual exceptional Mek Elek build quality. With a glossy green & white enamel shade, cast iron base & wired in twisted black flex. Timeless. Wear commensurate with age, overall very good with favourably worn, clean to the touch paintwork & a good shade. Measurement given(110cm) is a flat out measurement & overall height or reach depends on position.